These few months are very exciting and/or terrifying to many young dentists. Some have just graduated from dental schools, others are wrapping up their internships. Many have lots of things going on – applying for jobs or postgraduate studies with all the stress and paperwork that goes with that. Topping the list of requirements for any of these pursuits is the curriculum vitae (CV). The term CV is sometimes used interchangeably with the term “resume” and although they do have some similarities, a resume is much more brief and focuses only on key information. CVs are usually required for job applications and postgraduate training. 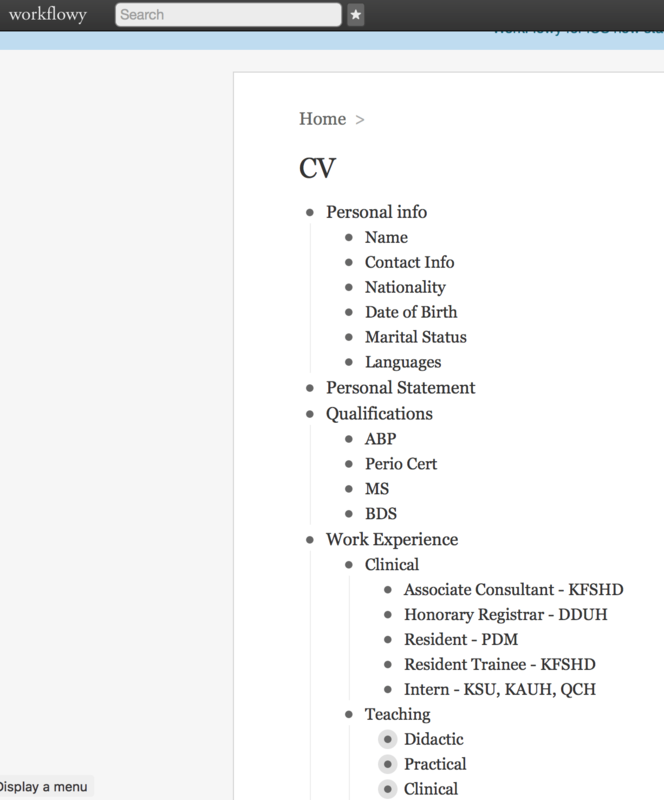 They can be many pages long but as it has been shown (https://cdn.theladders.net/static/images/basicSite/pdfs/TheLadders-EyeTracking-StudyC2.pdf) that recruiters spend very little time looking at CVs, it is wise to keep the information focused and to the point. In this post, I wanted to share some tips that can help you in creating your own. The first step would be to make an outline of the segments you plan to put in. It doesn’t need to be in perfect order from the start as it can be modified as needed. 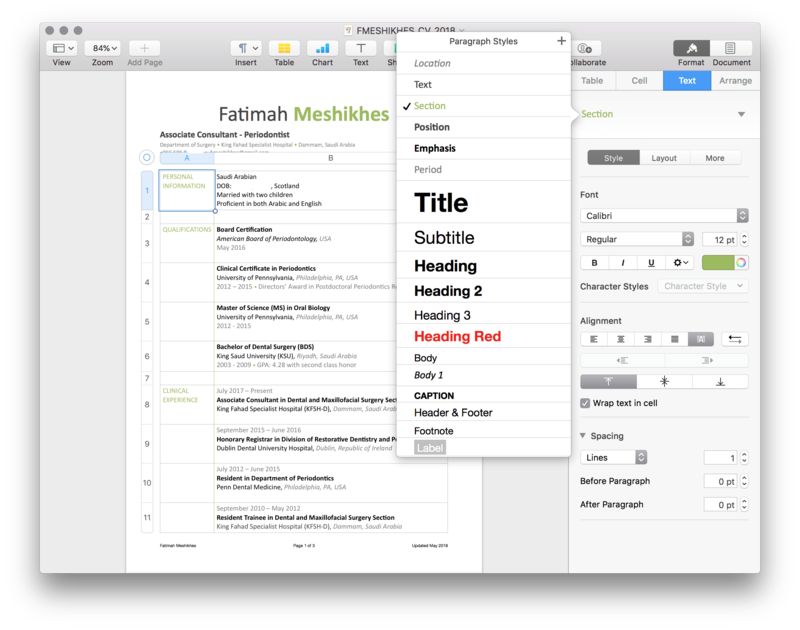 You can use pen and paper or any text processing application. 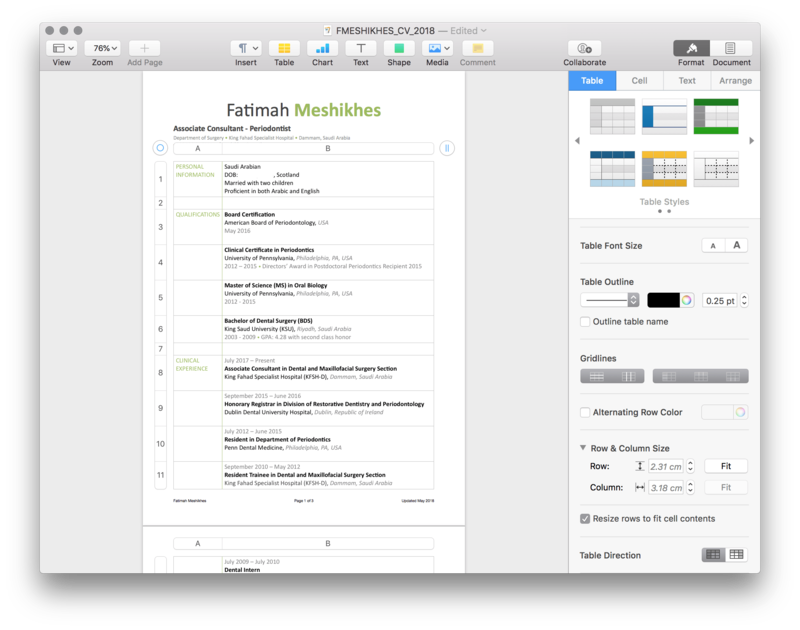 Whenever I am creating an outline, I personally prefer to use outlining apps such as workflowy (www.workflowy.com) as they allow me to focus on each section by itself and re-organize my structure as I go. There is no specific rule regarding the structure and sections of a basic CV but you will generally need sections for your personal information, education, experiences (this would include clinical, research, teaching…etc), activities (presentations, volunteering…etc). Other optional parts include personal statement, skills, hobbies…etc. These can be modified according to the purpose of your CV. For example, if you are applying to a specific position, a personal statement might be redundant especially if you are also attaching a statement of purpose and/or an assay. If you are applying for a program that requires you to pass certain tests, you may want to add a section for the test results so that they are in one clear place. 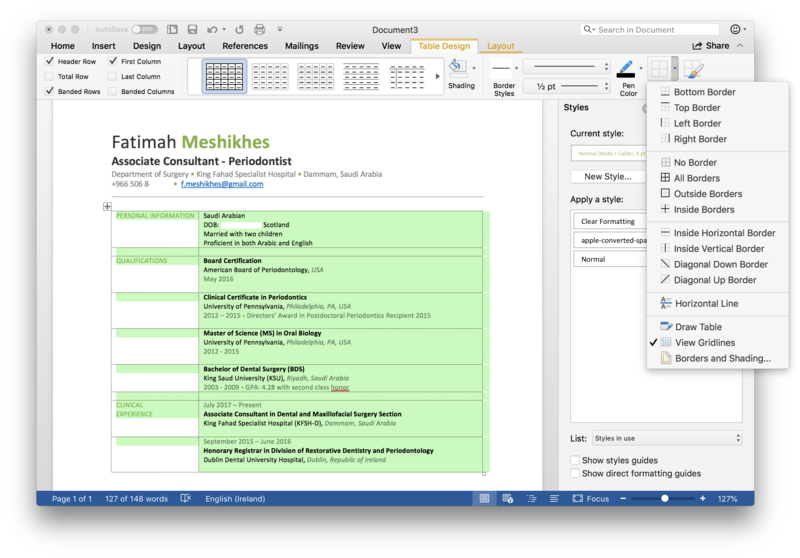 Again, there is no exact rule concerning the layout of a CV document. If you look at samples, you may see a wide range from very basic to elaborate ones with different colors or designs. You would want your CV to look special and eye catching but at the same time, you may want to stay away from the more trendy designs. Unless you know the people that you are submitting to closely, you wouldn’t know what their opinion would be so it’s safer to stick to the classical styles. There are many ways that a CV can be laid out. One way is to modify a ready made template. These templates can be found online or in word processors like Microsoft Word and Apple Pages. I find that templates are good if you want to have something ready quickly but they can be a bit tricky to expand and modify as the years go. I’ll show you the way I have mine done. It’s simple and I have been using it for years. I just update it and adjust it as needed. 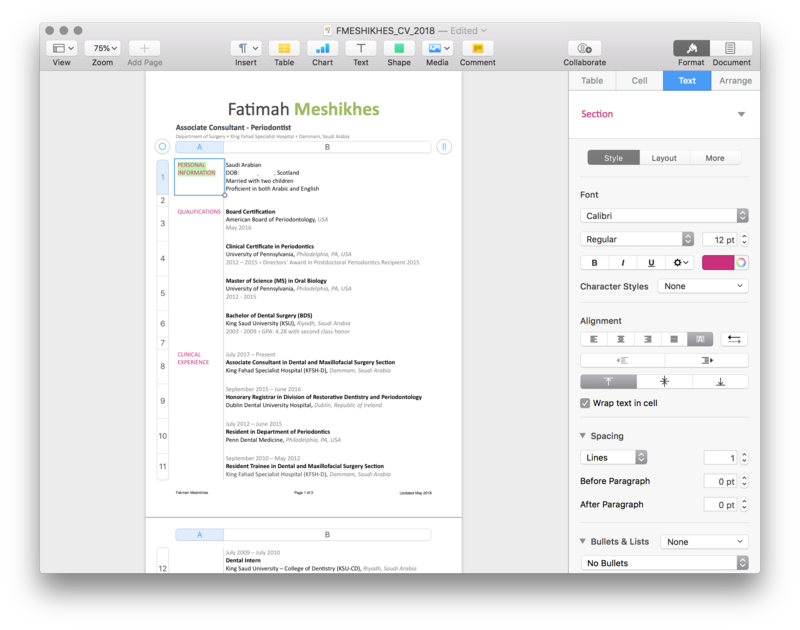 I’m an apple user so I usually use Pages but the same can be done in Microsoft Word. In order to keep everything organized, I use invisible tables. These help me make sure than everything is lined up perfectly and it makes it easier to control the sections. 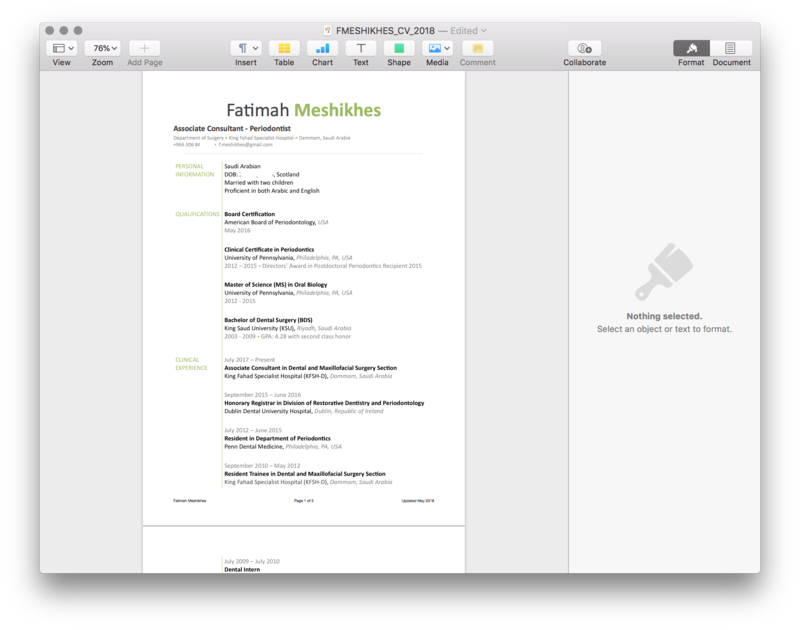 The images show my CV with the borders visible and how it actually looks after the borders are made invisible. I copied some items in word to show how it can be done, as well. I can also easily move sections up or down or add items without affecting the remaining parts too much. For example, when I was applying for residency, I had my experiences first followed by my education. At that time, I had done my internship and I was working as a resident in the hospital. I wanted to give that part more focus than my education as I had that advantage over someone who just graduated. When I graduated from residency and passed my boards, I moved education up on my CV and I put my current position in the header as at this point of my career, I feel that they give me more advantage. When I get promoted inshallah, I’ll probably bring the experience back up again. Having tables allows me to do this very easily by just dragging and dropping the whole row without changing the formatting. Another trick I use to help me stay consistent is using styles. In many times, when a person is not careful, the style or font of later edits might be different. Sometimes the changes are subtle but when they are seen, they show that this person is not meticulous and doesn’t pay much attention to detail. Before I start adding the info, I start defining my styles (this works for any document or presentation as well). I just type the text that I want, change the font and the style of it then use that to define a new section (Just click the (+) in pages and then change the name. In word, open the styles pane then click on the current style and choose new style). For example, I have the section titles in a green font while I have locations in a gray italic font. Once I have my styles set, I use them to create an item then I usually copy and paste that item into the next segment and just change the text while maintaining the formatting. The advantage of using styles is that if you want to change the style of a certain thing in the future (change the font or color…etc), all you will need to do is update the style and it will automatically get updated across the document which will minimize errors and save you time. Here I changed the color to pink and if I press “update”, all the sections which have the same style, will be changed as well. One final note about styles, in general, WHAT you did is more important that WHERE and WHEN so I prefer to give it more emphasis so that it’s what jumps out to the viewer when they are skimming. Once you have your outline and your layout, you’ll be almost halfway done. All you’ll need to do next is fill the info and prepare it for submission. You’ll learn more about this in PART II.